Is Mozambique Govt Downplaying Wave of Attacks? The shock cancellation of the special parliament session scheduled for Thursday and Friday, 21-22 June, threatens the 10 October municipal elections, which cannot take place without urgent new legislation. Over the weekend, both Frelimo and Renamo made belligerent statements, but hidden in those statements was an acceptance that a small agreement now on demilitarisation would be enough to save the elections. Constitutional amendments on decentralisation and election of mayors and governors were approved in May and the 21-22 June special parliament session was scheduled to approve the related electoral and municipal law changes. Without warning and with members of parliament already returning to Maputo, on Wednesday 20 June Frelimo told the parliament permanent commission that there could not be fair elections on 10 October if Renamo still had an armed wing, so it would not allow a vote on law changes without agreement on full demilitarization by 10 October. But the crisis must be resolved in the next month. Candidates lists for municipal assemblies must be submitted in July. The law is still being debated, and a key question is unresolved: Can the head of a list (and thus the candidate for mayor) come from outside the municipality? This makes it hard for parties to set up their lists. Frelimo's unexpected refusal to let parliament pass municipal election laws last week brings to the fore Frelimo and Renamo's deep and justified distrust of each other, and their fears that the other side will not carry out its promises. Renamo has restarted military actions several times and has added extra demands in negotiations. Government has apparently had a hit squad which killed senior Renamo figures in 2016 and attempted to kill the late leader Afonso Dhlakama. And government has used its central powers to limit municipalities by delaying funding, changing municipal boundaries, and other restrictions. So Frelimo fears Renamo won't disarm, and Renamo fears that elected governors and mayors will have their hands tied by central government. Renamo's armed militia is the only power it has in these negotiations, and it wants to be sure it trades that military power for real political power. Three issues must be resolved separately, but in parallel, and joint timing will be all important. Decentralisation: Under the current system, provincial governors and district administrators have substantial unregulated power, including over money, staff, land, and police. The constitutional amendment sensibly circumscribes these powers, but details will have to be worked out in new legislation which must be agreed this year. There is a new representative of the central state in provinces, districts and municipalities, and their role has yet to be defined. Officials in Maputo have opposed decentralisation, and have used regulations and administrative authority to curb the power of even Frelimo municipalities. There is a real danger that Maputo bureaucrats and Frelimo hardliners will try to curb devolved powers. Sometimes quite minor things can become symbolic. The ability to name streets and squares after local heroes is seen as an important symbol of decentralisation, but the draft municipalities law takes this power away from municipalities and gives it to central government. Frelimo could use this to prevent Renamo mayors from naming streets after Renamo's first commander, Andre Matsangaiza. Renamo will want to see detailed legislation and regulations, and then want to see that its governors and mayors really do have the power promised in the negotiations and laws. Renamo will also want to incorporate some of its military people into local police, after elections. That suggests demilitarisation can only be completed in 2020 or 2021, once some Renamo governors are in place. It is worth remembering that the tension between central and local government of different parties is not restricted to Mozambique. British Prime Minister Margaret Thatcher famously abolished elected local government in London in 1986 and central government ruled London for a decade. The replacement elected Greater London Authority still does not have full devolved powers. Military: Afonso Dhlakama wanted some of his generals genuinely integrated into the military and security services, to ensure that decisions - such as attempts to assassinate him - could not be taken by Frelimo loyalists without former Renamo members being aware. And he saw that after the 1992 peace accord, some former Renamo officials were marginalised in the new joint military, and did not want this to happen again. Traditionally Frelimo has preferred a weak military, in part to prevent military coups, and President Joaquim Chissano continued this. But President Armando Guebuza rejected this line and rearmed and strengthened the military as part of his power base. What appears to be on the table now is a return to a weak military, with a structure similar to the National Elections Commission (CNE) and elections secretariat (STAE). In STAE each senior post has a deputy, and one of the people is from Frelimo and one from Renamo. Officially they share the work, but in practice they keep an eye on each other. Dhlakama proposed this for the military and security services (SISE) and it appears that something like this will be accepted. Meanwhile, President Filipe Nyusi in his speeches has been stressing the role of the army in defending against external enemies and protecting the borders. Until now, Renamo has been the main enemy. A new weak military with a de facto joint Frelimo-Renamo command concentrated on defending the borders, participating in UN peacekeeping missions, and perhaps challenging Islamic extremism would suit both sides. Money: The unspoken third component to any agreement is money for Renamo. Aldo Ajello, the UN representative in Mozambique in 1993-4 (between the peace accord and elections) always stressed how important it had been to give money to Dhlakama and Renamo, and how he had done so personally. After the $2 bn secret loans which are widely seen as having benefited the Frelimo elite, Renamo will want a similar amount of money. Part of the settlement could have something like an Afonso Dhlakama Democracy Institute with perhaps $500 million as a mix of cash and gas company shares. Timing: This will be the hardest part. Some Renamo concessions will be essential in July with some kind of military law or agreement tabled to parliament before local elections on 10 October. In parallel the provincial and district decentralisation law will need to be tabled. A restructured military with named Renamo generals in key positions could be possible this year. The hardest part will be how to define and structure a step-by-step demilitarisation ending in 2020 or 2021, with both sides maintaining some leverage until the end. An answer might be that remaining Renamo armed men are sent abroad in 2019 for police and military training and only return in late 2020. Infighting: Both sides are also divided internally. Renamo only has a temporary leader, Ossufo Momade, without the unquestioned authority of the late head Afonso Dhlakama. Frelimo's blocking of the special parliament sessions is perhaps intended to push Momade into negotiations with President Filipe Nyusi before Momade has established what his own factions will accept. Also, General Momade comes from the military side, and with elections coming up soon he will need to quickly reach agreements with the younger generation, with the electoral side, and with possible MDM people who may want to join Renamo or form local coalitions. A full agenda for the new leader. On the Frelimo side, the ambush of the special parliament session was probably pushed by the hard liners within the party, who do not want a deal with Renamo and want to hit it now when it is weak after the death of Dhlakama. Frelimo seems likely to lose several cities in municipal elections and some in Frelimo would be happy to postpone or cancel local elections. This group in Frelimo may be challenging what had been seen as an implicit deal within the party. The hard line is also linked to those who have gained from the Guebuza era, with businesses and the $2 bn secret debt. The deal appeared to be that in exchange for not providing any more information on the secret debt and compromising Guebuza and his allies, Nyusi would be allowed to reach a peace deal. He would then go into elections as the peace-maker. And he would be able carry the deal into talks with the IMF and donors. The international community wants to know where the money went, effectively demanding the head of Guebuza. Nyusi would say to the IMF and donors that he had brought peace by personally negotiating a deal with Renamo, which could only be done by keeping Frelimo together and not identifying the guilty, and that the international community should accept that deal and restore aid. A four-way negotiation must be carried out in some haste, in a country where these things normally happen slowly. Can something be cobbled together in the next few weeks? Zenaida Machado of Human Rights Watch told a conference at Chatham House, London, on 20 June that "people have disappeared at the hands of the military" and others have not been sent to hospital despite being injured. But the military is also poorly supplied, with soldiers having to buy food from local markets. Angelina Nguirezi, administrator of the Niassa district of Marrupa, has again raised the issue of lack of jobs, and called on young people not to be deceived when people of doubtful origin offer them jobs. Nguirezi also called on households and on religious leaders not to offer hospitality in their homes and places of worship to people who they do not know, without first informing the authorities. "The Emergence of Violent Extremism in Northern Mozambique", by Gregory Pirio, Robert Pittelli, and Yussuf Adam, 25 March. The Africa Centre for Strategic Studies paper points to two leaders inspired by international jihadism. A Gambian named Musa actively sought out recruits in Montepeuz District among segments of the population with grievances against both the security forces of an international mining company, Gemfields, and the national police, attempting to transform local grievances into a narrative of revenge. A Mozambican who goes by the name Nuro Adremane reportedly received a scholarship to train in Somalia, traveling by road through Tanzania and Kenya to reach Somalia, as did a number of other members of the group. Good background to the conflict. 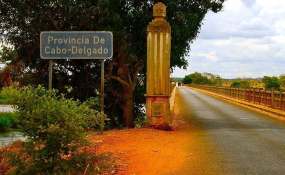 Lusa, 22 June, "Deals and quarrels between mosques preceded bloody day in Mozambique"
Zenaida Machado, "Suspected Armed Islamists in Mozambique Attack More Villages: Government Should Show More Transparency in its Response", Human Rights Watch, 29 May. Financial Times 21 June, Joseph Cotterill, "Shadowy insurgents threaten Mozambique gas bonanza"
Deutsche Welle 23 June, "Mozambican government downplays wave of attacks"
Lusa, 4 June, "People displaced by attacks in northern Mozambique call for help"